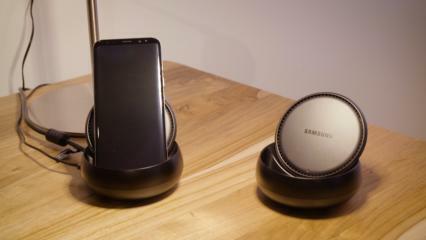 Samsung introduced a docking device called DeX on Wednesday that will work with its next-generation smartphones also announced today at a New York event -- the Galaxy S8 and S8+. The big question for Samsung will be how many workers and companies decide to buy the DeX. It is designed to let an employee access apps, edit documents and browse the web and videos when his or her smartphone is inserted in the dock and is connected to a larger display, keyboard and mouse. DeX is a small, hockey puck-shaped device that is about four inches in diameter. When a user presses it in the middle, a cradle pops up. 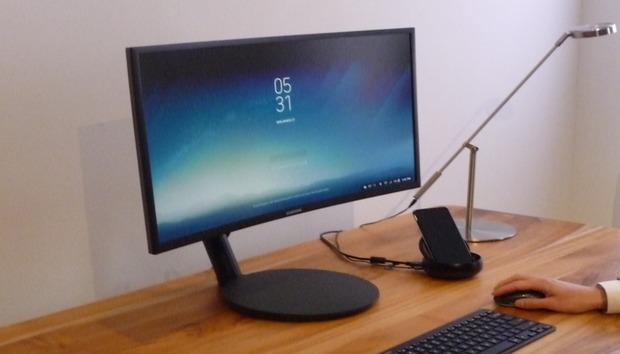 A user can cradle an S8 smartphone via USB Type C and can plug in a full-sized keyboard and mouse as well as a larger display through an HDMI port. DeX allows fast wireless charging and even has a built-in cooling fan. Samsung clearly sees a market for the device, which will provide an Android-based, desktop-like experience when connected with the smartphone and all the other devices. Samsung worked with Microsoft and Adobe; for remote and secure virtual desktop access, Samsung worked with Citrix, VMware and Amazon Web Services, the company said. Gartner analyst Werner Goertz got an up-close preview of the device and said he would "certainly buy one and use one," adding it would provide a "valuable, complementary user experience." But then he added: "I doubt it will replace my PC." Indeed, DeX could prove to be one more thing that mobile workers desire, pay for and might not use very often. Docks for smartphones have not caught on so far. Several have been introduced, including the Motorola Atrix six years ago and HP's more recent Elite X3 dock. None have sold very well, analysts said. "Docking stations [for smartphones] are nothing new," Goertz said, noting that Microsoft introduced Continuum to work with Windows Mobile phones, which have already died out in the market. "Continuum at least offered software and UI support to make the transition seamless, whereas DeX will rely on Windows emulation," Goertz said. All Goertz got to see in his preview was a Windows desktop and Office 365. "The big question is whether and how enterprise productivity software like SharePoint applications sitting behind a VPN will run, and what the user experience is going to be with Galaxy S8 and DeX," he added. A big failing with previous virtual desktop experiences from a smartphone is that a larger display has presented blurred or inexact images of an app that looks fine on a small smartphone screen. The result hasn't been very satisfying so far, several analysts said. Patrick Moorhead, an analyst at Moor Insights & Strategy said he's "optimistic" for DeX, since each new dock on the market has improved the user experience. "The biggest challenge is whether apps that provide a good experience on a 6-in. phone display can [look good] on a 13-in. or even a 30-in. display," he said. DeX will be different, according to Calvin Hsu, vice president of apps delivery for Citrix, which worked on the device. "Smartphone docks have definitely been around for a while and we've seen a few of these come and go," Hsu said in an interview before Wednesday's announcement. "But a few changes have happened in recent years, so you'll see a resurgence in interest." One big change is that the app ecosystem wasn't as mature as it is today. Also, the display resolution and processing power of today's phones has improved, he said. It will also help the virtual desktop experience with DeX that the Samsung Galaxy S8 and S8 Plus will run fast octacore processors with 64-bit computing and will feature displays that are Quad HD-Plus. On Wednesday, Samsung officially revealed that the S8, with its 5.8-in. display with 570 pixels per inch, while the S8+, with its 6.2-in. display, will provide 529 pixels per inch. Citrix described two types of workers who could effectively use DeX. A law enforcement officer could dock the S8 inside a patrol car and work on a larger display and keyboard to fill out reports. An insurance adjuster could use the S8 to photograph an accident scene, then quickly dock with DeX inside the car or office to add the photos to a report, edit them and fill out added details. Hsu said Citrix has a "huge" installed base of enterprise customers who are potential customers of DeX. "Customers will find a use for this device just because we know that not every enterprise app can be replicated on smartphones, Windows apps in particular," he said. Business apps like ERP and CRM and SAP supply-chain apps, as well as electronic medical records, will benefit from being used with DeX, he said. "It should be just plug and play," Hsu added. "Docking is more elegant." Customers with Citrix Receiver software already installed on their servers through Xen Desktop or a Xen App license will be able to benefit from the virtual interface with the S8 phones at no added cost. Sold individually, Hsu said the DeX could cost $150, but Samsung announced it might be bundled with the new smartphones in some regions.